This is a very interesting book – the jargon of the 1st person protagonist, an 11-year old immigrant from Ghana to the ghettos of London, is totally believable – but not quite comprehensible. I enjoyed figuring out what Harrison was telling us – the Kindle search feature helped me look at several examples for context. Ghana is a small, very poor, Christian country on the Gulf of Guinea in western Africa. It has a fairly high migration rate with some labeled as refugees. According to the news, Ghana is plagued with corruption. * bo-styles – boss styles? * Donkey miles – literally translated Ghanese – long – similar to mountain miles. * idey – “The hunger idey almost killed me.” – idea? * numpties- nobodies? Humpty dumpty numptie? fool? * tro-tros – Ghana – trolley? ** The language works to make the reader feel a bit of an outsider. The narrator sometimes explains words or phrases that the reader would probably know so he might be writing or talking to someone from his homeland. Harrison lives with his mother and older sister on the 9th floor of a very flimsy ghetto housing project. His father and a couple other relatives are still in Ghana and trying to join Harrison and family. Harrison and his street buds are investigating the stabbing murder of an acquaintance. Harrison was almost a witness – it appeared the stabber wanted the dead boy’s food. The boy is bright and funny. kind and innocent yet he lies, steals, cheats and runs with his buds. He likes to read, he knows how to spell, he stays out of trouble with the tougher, older gangs. He has a great imagination. He appreciates some of the male adults – Mr. Fromlin from church, Pastor Taylor, Mr. Tomlin, his science teacher. He has a girlfriend named Poppy with yellow hair. Sad to be coming of age when you’re only 11. I’m enjoying the book very much! Setting – ? the reader is left pretty much to invent this himself – that’s fine – there’s plenty going on without a lot of energy going into setting descriptions. Metaphors – what few are used are clichéd, but that’s perfect because of the age of the protagonist and the theme of language – Blood a huge plot element as well as metaphor. Aunt Sonia’s little tree seems to be a metaphor for a live thing trapped inside – but it’s a trick (maybe on the reader, too?). Themes – African immigrants, (how does this fit with other immigrant stories – the US has a whole genre full), language, rules, dreams for future – from next year to heaven – Forever, outsiders, missing home and people, old ways vs new ways, memory, senses, growing up. Fears and having PROTECTION like dogs and body parts, family, friends, the bat, skills like who can run or fight best, Superman, Spiderman, flying, the alligator tooth, teachers, the church, and the pigeon probably more. Harri wants to protect others – Agnes, Poppy, Pigeon. And I updated the vocabulary again! Thank you! This is great. 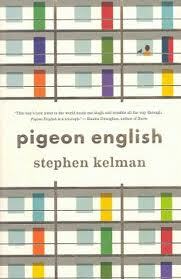 Does anyone have a paper on Pigeon English??? I think this is all there is – a little review, probably not enough for a school project. Fab list! I think hutious might mean dangerous rather than hideous/righteous?